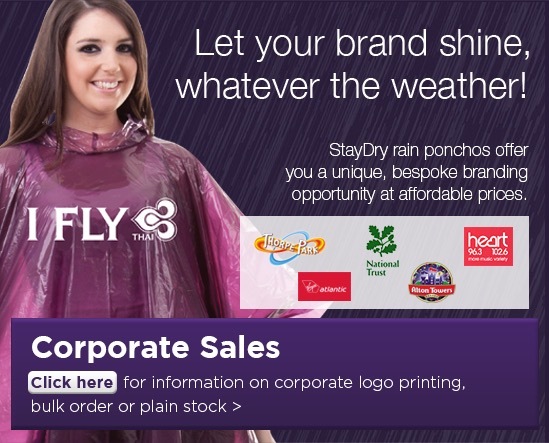 StayDry the UK's favourite promotional rain poncho company. Your one-stop shop for rain ponchos, rain capes, raincoats and over trousers, which are ideal for all outdoor events festivals and theme parks and are available for immediate delivery. We stock both adult and child disposable and reusable waterproof rain ponchos, which are ideal for all outdoor events. If you are looking for an eco-friendly rain poncho, we can offer both degradable and biodegradable materials. We also offer a bespoke printing service whereby you can have your waterproof rain poncho printed with your own corporate logo or brand, for any promotional event. (minimum order quantity for printing a logo is 1,000 units). For more information on printed waterproof rain ponchos, either email us at sales@staydry.co.uk or call the sales office on 01299 253009. 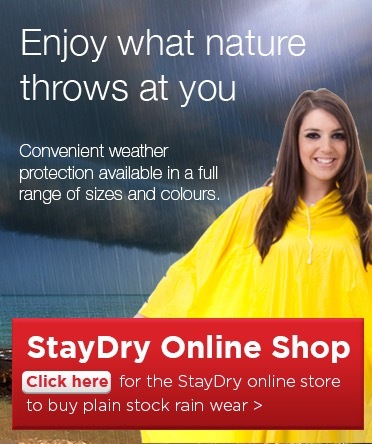 StayDry has been supplying rain ponchos for all outdoor events since 2001 and the UK's favourite theme parks and attractions, Alton towers, Blackpool Pleasure beach, Chessington World of Adventure, Gulliver's, Thorpe Park and Warwick Castle. If you need waterproof ponchos for your attraction or event then please get in touch. The online shop is only one click away, have a look around and if you need any help just call or email us and we will be only to pleased to help. StayDry has relocated to a new home, Friars Court, Worcester Road, Harvington, Worcestershire DY10 4NE. 25% Discount on ALL products!! Simply enter code sd25 at checkout.